Master Limited Partnerships (MLPs) have become one of the most popular types of high-yield dividend stocks in this age of record low interest rates. However, like with most high-yield stock classes, MLPs have their own unique challenges when it comes to successfully investing for the long-term. Let’s take a look at what makes MLPs different than regular dividends stocks and what things investors need to focus on in order to navigate these challenging and potentially treacherous waters. Like shares of common stocks in regular corporations or C-corps, shares of MLPs, which are called “units”, give you an ownership stake in the partnership’s business. MLPs were created in the 1980s by Congress in order to help a particular class of businesses raise capital from investors. In this case any business that operates in the extraction, transportation, or processing of natural resources. The majority of MLPs operate in the oil & gas sector, particularly in the midstream space. Midstream MLPs are those that specialize in the gathering, storage, processing, and transportation of oil, gas, and refined petrochemicals. Midstream MLPs generally derive most of their cash flow from long-term, fixed-fee contracts, which makes their cash flow far less volatile than that of regular oil & gas companies who are at the mercy of cyclical commodity prices. In other words, most midstream MLPs are tollbooth-like operators whose stable cash flows allow them to pay generous, and hopefully secure, dividends. However, MLPs are a special type of company known as “pass-through” entities, which means that the partnership doesn’t pay corporate taxes because it passes through its cash flow and tax obligations to unit holders. There are several other differences between MLPs and C-corps, too. Perhaps the biggest difference is that MLPs, because they pass on the majority of their cash flow as distributions, retain very little earnings with which they can fund growth investments, such as construction of a new pipeline. In fact, their entire business model is predicated on using the majority of cash flow to fund a generous payout (to attract investors) and then fund growth through external debt and equity issuances. In other words, like other pass-through stock classes such as Real Estate Investment Trusts (REITs), Business Development Corporations (BDCs), and YieldCos, MLPs are largely dependent on external capital markets and their unit counts generally rise over time. 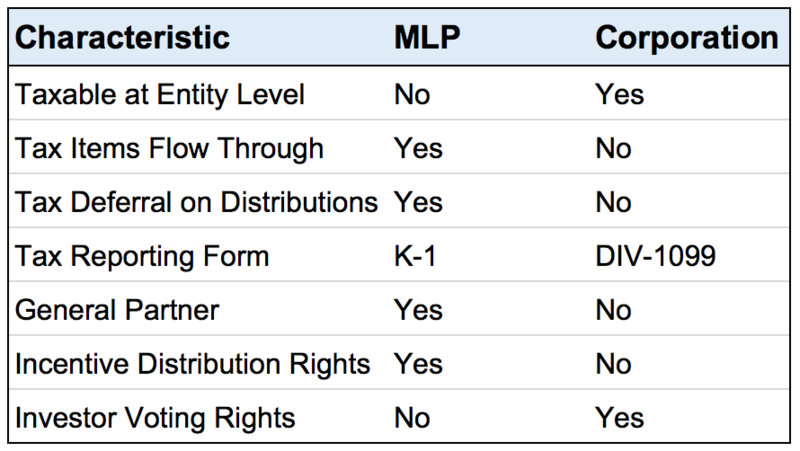 In addition, there are several other differences between MLPs and corporations to be aware of. The biggest and most important differences for income investors are how MLPs are taxed and the presence of a general partner and its incentive distribution rights. Distributions vs. Dividends – What’s The Difference? Unlike C-corps, which pay dividends, MLPs pay a special kind of dividend known as a distribution. The biggest difference is how these are taxed. A dividend is paid out of a corporation’s free cash flow and is usually considered “qualified”, which means that it is taxed at the same rate as long-term capital gains. However, MLPs, because of their special tax status as pass-through entities, pay distributions, which are a kind of tax-deferred dividend. The reason for this is because the MLP doesn’t just pass on its cash flow in the form of payouts, but also its tax obligations (remember, MLPs don’t pay corporate taxes). And because of the highly capital-intensive nature of the industry, the amount of depreciation and amortization that MLPs generate is enormous. As a result of their substantial non-cash depreciation and amortization charges, MLPs’ GAAP earnings are artificially suppressed, and the distributions paid are usually higher than earnings. Therefore, the IRS considers the majority of an MLP’s distribution a return of capital, or ROC. Unlike qualified dividends which are taxed at 0%, 15%, or 20% rates, ROC isn’t taxed, at least not right away. That’s because the IRS considers any ROC portion of a distribution to be the equivalent of an MLP simply returning capital to investors and thus not truly income or capital gains. 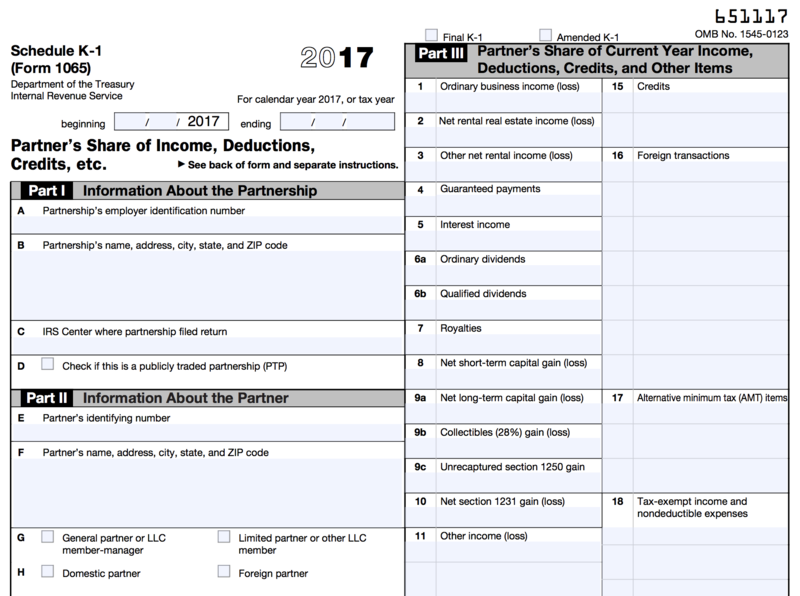 The ROC portion of a distribution is outlined in the annual K-1 form that all MLPs send you at tax time. As you can see in the example below, this form can significantly increase your complexity at tax time. However, services such as Turbotax are an easy and cost effective means of streamlining the process and generally require no more than 10 minutes per K-1. The ROC portion of a distribution, rather than be taxed right away, instead decreases your cost basis, potentially all the way to zero. At that point the distributions are taxed as long-term capital gains, just like qualified dividends. When you sell an MLP, then the government will recoup those deferred taxes, because your capital gain will be larger by the amount of your cumulative ROC. For example, if you paid $10 per share for your units and received $3 per share in distributions that are classified as a return of capital, your new cost basis would be $7 per share rather than $10. If you then sold your shares for $12 per share, your gain would be $5 per share ($12 sale price minus $7 adjusted cost basis), which captures the ROC distributions you previously received but weren’t taxed on. Essentially, MLPs can provide potential tax advantages, including deferring distribution taxes by your total cost basis. In fact, if you never sell your units, then when you pass on and your heirs inherit them, the cost basis will be adjusted up to the stock’s price on the day of your death. That means that you and your family could potentially permanently defer those taxes, up to $5.6 million per individual, or $11.2 million couple. This is the most you can pass onto your heirs before the estate tax kicks in. In other words, if you spend decades buying and holding quality MLPs, such as Enterprise Products Partners or Magellan Midstream Partners, then you could potentially avoid a mountain of taxes and leave your heirs with large and income producing inheritances. However, investors should be aware that MLPs are inappropriate investments for retirement accounts. In fact, if you own an MLP in a retirement account, you could actually owe tax on your investment. What Are Incentive Distribution Rights and Why Do They Matter? The other two important differences between C-corps and MLPs are that the majority of MLPs have what is known as a general partner, or GP. These are the sponsors and managers of the MLP’s assets. Usually a GP will own a 2% GP stake, a large amount of regular units, and something called incentive distribution rights, or IDRs. The idea behind MLPs is that they allow a company that owns a lot of MLP qualifying assets to monetize them in a highly tax efficient manner. Here’s how it works. Phillips 66 (PSX), which is one of America’s largest oil refiners and petrochemical manufacturers, owns a lot of midstream assets. In 2013 the company set up Phillip 66 Partners (PSXP) as an MLP in order to help it to grow and diversify its business away from volatile refining to better stabilize its long-term cash flows. Phillips 66 Partners would raise debt and equity capital from investors and then buy Phillips 66’s midstream assets in what is known in the industry as “drop downs.” These purchases would be paid for the form of either cash, debt assumption, or new units. In this way, Phillips 66 could recoup the construction costs of these assets, and then reinvest that money into growing its business. Meanwhile, Phillips 66 Partners would get a valuable, cash flow-producing asset with long-term contracts with Phillips 66, who serves as GP, sponsor, and manager. And because Phillips 66 owns the majority of its MLP’s units and the incentive distribution rights, this means that the vast majority of PSXP’s fast-growing distribution is flowing back to it. But what exactly are IDRs? They are incentives designed to get the GP to grow the MLP and raise the distribution over time. That’s because they entitle the GP to up to 50% of all distributions above certain hurdle rates. The table below provides an example. As the quarterly distribution amount to LPs rises (far right column), the GP’s share of cash distributions increases from 0% to 50%. In other words, the cash distribution growth enjoyed by LPs will be much less than the MLP’s total distribution growth because an increasing share of it goes to the GP. IDRs are a double-edged sword. On one hand they give a GP strong incentive to grow the MLP’s distribution, which raises its distribution flow. On the other hand, IDRs also mean that 50% of the MLP’s distributable cash flow, or DCF (similar to free cash flow for MLPs), ends up going to the GP instead of regular unit holders (investors). This means that IDRs increase the cost of capital of an MLP and can ultimately limit the long-term growth rates of an MLP. This is because an MLP can only invest in a new project or acquire new assets if the expected return on investment (i.e. cash yield) is greater than the MLP’s weighted average cost of capital, meaning both equity and debt. Since IDRs raise the cost of capital, each new potential investment has a higher bar to clear in order to be accretive (i.e. increase DCF per share). Being able to make accretive investments is critical to all MLPs, because with a rising share count built into the business model, DCF per share growth is the only way that an MLP can grow its payout sustainably over time. Because MLPs are so different than regular corporations, the financial metrics that matter most are also different. Here are the most important things to focus on in order to successfully invest in this high-yield sector. Arguably the most important metric to understand is distributable cash flow, or DCF. This is the MLP equivalent of free cash flow and ultimately funds the distribution in the long-term. While MLPs can sometimes vary in how they calculate DCF, the general formula is Adjusted EBITDA minus maintenance capex. Adjusted EBITDA, or Earnings Before Interest, Taxes, Depreciation, and Amortization, basically tells you how much cash is left over after paying the operating costs of running its business and excluding one-time charges. Meanwhile, maintenance capex is how much the MLP must pay to keep its infrastructure, such as pipelines and storage tanks, from deteriorating and becoming useless. This is also the biggest difference between DCF and free cash flow for corporations. Corporations, because they aim to pay for both maintenance and growth capex out of retained earnings (and thus generally don’t sell new shares to raise growth capital) calculate free cash flow by subtracting total capex (which includes maintenance and growth capex) from operating cash flow. However, because the business model of MLPs is based around funding growth spending via external capital sources (i.e. debt and equity), growth capex is excluded from DCF. The first step in deciding whether or not an MLP is worthy of risking your hard-earned money is the distribution coverage ratio, or DCR. This is simply the ratio of DCF over distributions paid to all investors, including GPs. If the ratio is above 1.0x, then the distribution appears sustainable by current operations alone. However, because an MLP’s DCF isn’t entirely stable over time (some of its contracts are based around commodity prices, especially when it comes to natural gas liquids, or NGL operations), it is preferable for the DCF to be at 1.1x or above. A DCR of less than 1 over an entire year or longer, is a major red flag that the distribution isn’t sustainable or safe and could be cut in the future. Our website makes it easy to see an MLP's current, projected, and historical distribution coverage. We plot the DCF payout ratio, which is calculated by dividing an MLP's distributions by its DCF over a 12-month period of time. A payout ratio below 100% indicates that the distribution is more than covered by an MLP's DCF. Here is a look at Magellan Midstream Partners' DCF payout ratio. You can immediately see that management has been conservative with the firm's payout policy, keeping a ratio near 80% over the years (equivalent to a 1.25x distribution coverage ratio). Given the highly capital-intensive nature of the MLP industry, it’s important for investors to know how much available capital an MLP has in order to grow. This includes cash plus existing revolving credit facilities, as well as short-term (i.e. less than one year) credit lines. The ideal MLP will have enough liquidity to allow for at least a couple of years of growth in which time management is likely to be able to obtain additional financial resources through debt and equity offerings. It’s worth noting that liquidity can be fickle, driving up the cost of capital to a level that forces ill-prepared MLPs to make the tough choice between continuing their current distributions or growth projects. This is essentially what happened to Kinder Morgan (KMI), which was an MLP until 2014, when debt and equity markets quickly soured on the MLP sector. With the company’s stock price tumbling in 2015, KMI’s high dividend yield made it too expensive to sell new units to raise capital. Management ultimately had to slash the distribution by 75% to protect the balance sheet and continue funding its growth projects. Speaking of the balance sheet, debt is another really important factor MLP investors need to consider. While debt is an important part of MLP funding and can lower a firm’s overall cost of capital, it is another double-edged sword. After all, most MLPs that end up cutting their distributions do so not just because their DCR ratios are under one, but also because their debt burdens become unsustainable. This means that their Debt / EBITDA ratio, which is the most important debt metric in this industry, gets so high as to threaten their debt covenants, credit rating, or both. Credit rating agencies generally like to see Debt / EBITDA ratios of 4.5 or less. In addition, an MLPs debt covenants, which are tied to their credit facilities, usually state an absolute limit to this ratio above which an MLP’s loans can be called in early should they be violated. This can result in a liquidity crisis in which the risk of losing an investment-grade credit rating (and having to obtain new or refinanced debt in the much higher cost junk bond market) can force management to cut the distribution so that more DCF can be used to pay back creditors. In other words, an MLP’s balance sheet is the second critical piece (in addition to DCR) to determining how safe an MLP’s payout really is. A conservative approach to debt not only helps ensure safe payouts, but also provides MLPs with plenty of access to cheap debt capital they can use for growth projects. Most MLPs have lower Dividend Safety Scores reflecting their high debt burdens, dependence on raising capital, and elevated payout ratios. There is not much margin for error. Valuing MLPs can be tricky if you don’t know what metrics to use. For example, the P/E ratio, which is one of the most well-known valuation metrics, doesn’t work well for this industry. That’s because the substantial non-cash depreciation and amortization charges that MLPs must take on their asset-heavy businesses reduce GAAP earnings and result in artificially high P/E ratios (as well as alarmingly but falsely high EPS and free cash flow payout ratios). That’s why there are two primary methods of valuing MLPs that do not use as-reported GAAP earnings – Price / DCF ratio and dividend yield. The price-to-distributable cash flow (Price / DCF) ratio is a great way to know what you’re paying for an MLP’s units, using the metric that actually funds the distribution. Many MLP investors also focus on dividend yield, which is the underlying reason for owning MLPs in the first place, as a way to quickly determine whether an MLP is undervalued or not relative to its historical trading range. Our website allows you to see not just the current yield, but also an MLP’s historical yield and five-year average yield. That allows you to see whether or not today could be a reasonable time to buy an MLP for income. 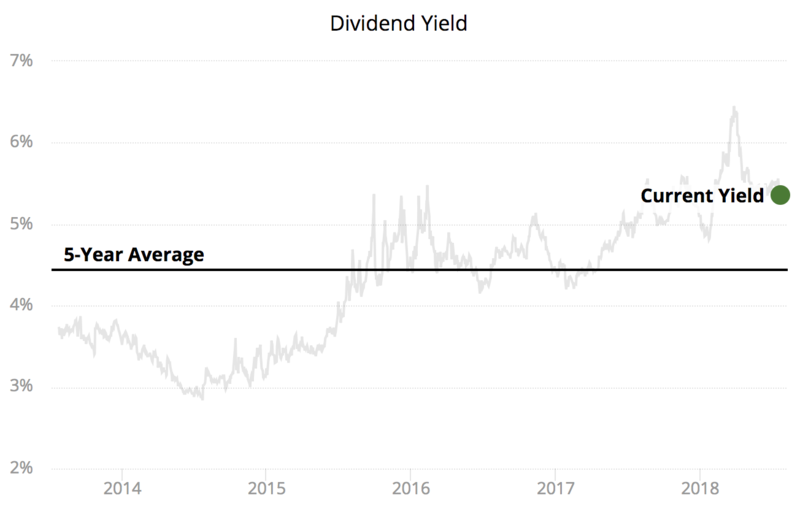 Here is a look at Magellan Midstream Partners' dividend yield over the last five years. Investing in MLPs isn’t easy, with the industry’s nuances requiring investors to show dedication to self-education and due diligence. While there are several high quality MLPs, the majority of MLPs possess risks we are simply not comfortable with (e.g. too much debt; excessive dependence on capital markets for financing; low coverage ratios; rising interest rates). However, if you have the time and interest in following this industry, some MLPs can offer a long-term method of generating substantial income and unique tax advantages as part of a well-diversified dividend portfolio. The key, as with all investing, is to be highly selective about which MLPs to entrust your money to. However, if you focus on the metrics that matter, you can help maximize your chances of avoiding value traps, such as those MLPs that are likely to cut their payouts in the future.